Free-spool carp reel. This model is packed with 8 ball-bearings, has an aluminium spool plus spare graphite spool, instant anti-reverse (OWC) and a one-touch folding handle. 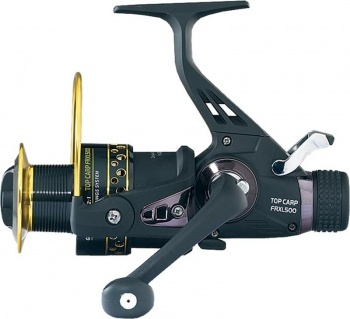 The size 500 reel has a capacity of 230 yards of 15lb (0.35mm) mono. Finished in a lovely black and gold colour scheme.